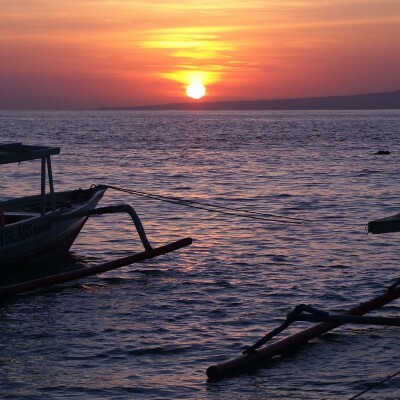 Everyone that I met and became friends with on Gili Meno made such an impression on me and I will never ever forget them for as long as I live. Barone was my first friend that I met on the island back in April and probably one of my favorites. Every time I think of Gili Meno, he is the first person that comes to mind. His dark skin, beautiful brown eyes and a laugh that is contagious. He has a feisty spirit and you can’t help but smile when you are around him. 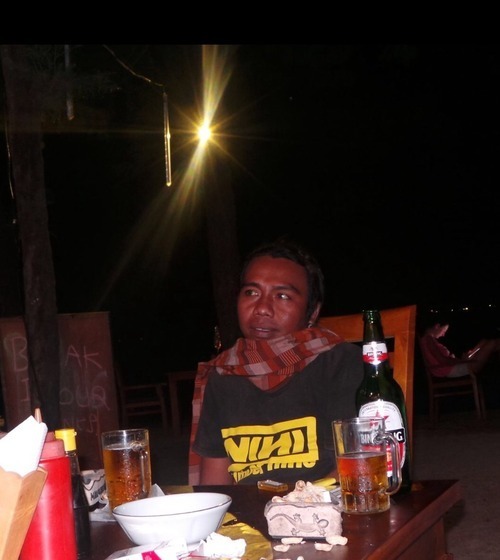 He comes from Lombok and is around 30 years old (he doesn’t know his exact age). 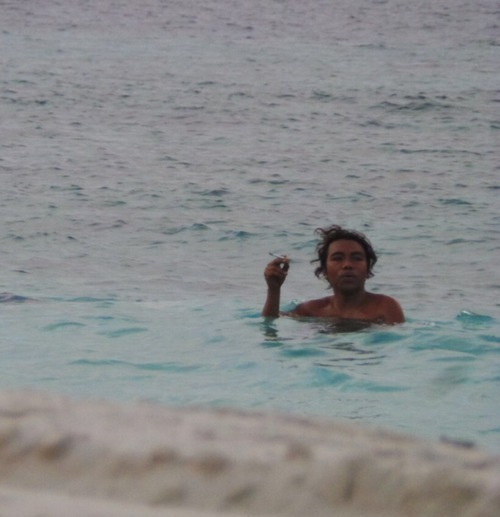 He spends his days trying to meet tourists and offering services such as snorkeling (on someone else’s boat where he gets a dollar for each recruitment) or to take them around Lombok (in someone else’s car where he will make $10 for a full day of work). The boy doesn’t have a cent to his name but he keeps the spirit and thats why I like being around him. I love Barone, not in a romantic way but in a way that you love that neighborhood kid who never had any guidance and was always hanging around your house and hoping to be invited for dinner. He is just lovable! When he doesn’t have any luck in finding tourists to show around he passes his days working (and I use that word loosely) at his uncle’s “warung” waiting for someone, ANYONE to come by and order a juice or a meal but they rarely do. 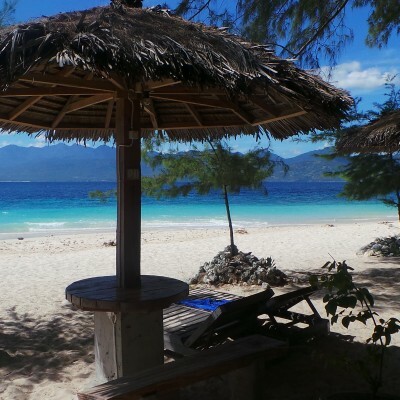 The warung is set up for failure because the prices are the same as the other cafes and restaurants on the island but but the beer is usually warm (if there is any in stock) and there is rarely any ice for the fresh juices but nevertheless he makes it work. His uncle sometimes gets annoyed with him because he is always inviting tourists there in the evening for a bonfire as he plays the guitar. The problem is that they never end up ordering drinks. All the time his uncle is saying, “Barone, you can’t invite people to our “warung” if they are not going to order anything! This is not a hangout spot but an establishment.” Barone doesn’t get it and just enjoys being around people. Sometimes, when I noticed that Barone hadn’t had any customers in a while I’d tell him that I was coming for dinner. His eyes would light up and he would run to the store to get some ingredients. There is no menu at the “warung”, you go and order dinner and whatever they have is what you get. He is a fantastic chef and you can see that that is his true calling. When he cooks he is in his element. He cranks up the music and sings along as he chops and minces the vegetables sprinkling them with all sorts of seasonings. It may take an hour or more before you get your food but it is darn good and made with love. And as always, as soon as he sets the plate down in front of me I would say, “would you like some” and within 3 seconds he’d sit down and scoop half of it on to his plate. It’s ok though, I didn’t go for the food, I went to give him business and so that Barone could have a good dinner. 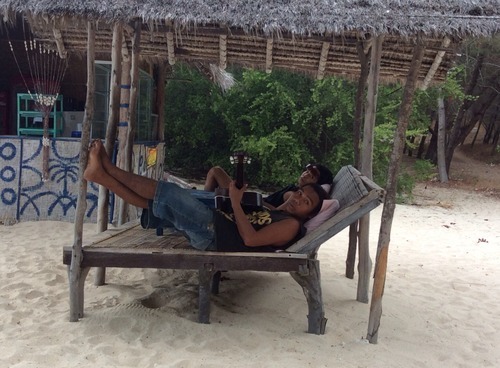 On Gili Meno everyone shares everything. We shared drinks and food usually right off the same plate as we eat with our hands. It’s amazing how one plate of food could sometimes feed 3-4 mouths but in the end we were all satisfied. He is a phenomenal guitar player and has a truly angelic voice. He brings tears to my eyes when he sings. 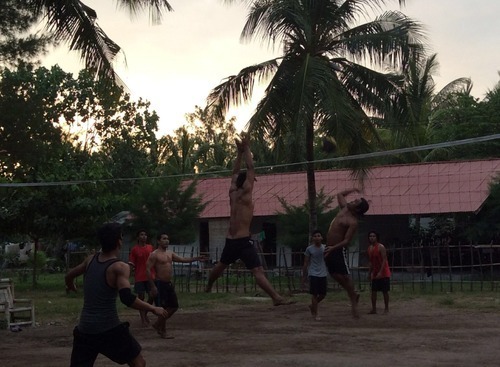 And for being short he is a fantastic volleyball player. That boy can jump and has a killer spike. For someone that has nothing, you would never know it, he has a good attitude and keeps it real. I wish I could help Barone in some way figure out his life. He just doesn’t have any guidance, and never had, from the looks of it. He wants to be successful but no one has ever taught him how to do that. 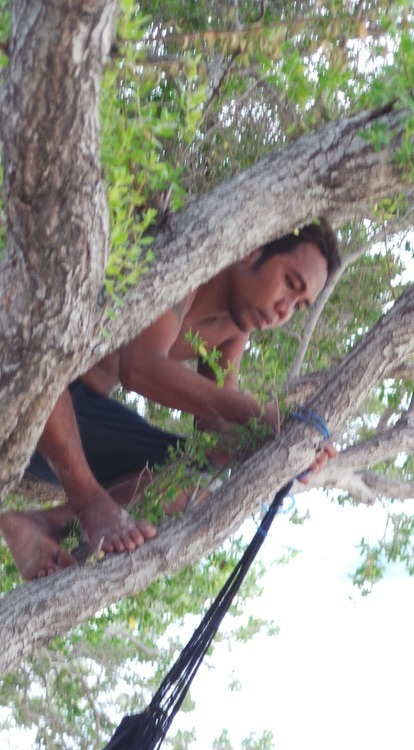 He has so much potential to do many things but on an island such as Gili Meno the opportunity just isn’t there. 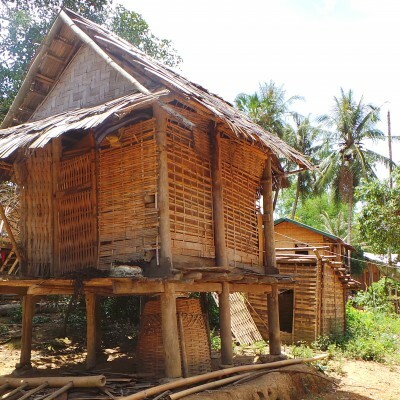 However, in places like Lombok, it’s too expensive for him to live without a set income so he stays on Meno hoping for the “high season” where he can make good money. But there never really is a high season, the place is just not discovered yet. I once asked him why he doesn’t get a job in a cafe or on a boat to which he responded, “yeah but there is no freedom in that and the pay isn’t worth it.” People that work in cafes work from 7AM until 9PM at night (with 2 days off a month) and they only get paid around $70-$100 a month. Can you imagine? I don’t think I would want to work there either. So instead he lives day to day with whatever money he can scrounge up and the rest on handouts. When I first met him back in April I told him that the name Barone didn’t sound like an Indonesian name. He told me that it wasn’t his real name. Of course I had to ask him what his real name was to which he replied, “it’s personal, I don’t tell just anyone and since I don’t know you that well, I don’t feel comfortable telling you my real name”. As I said, Indonesians keeps their personal lives very private, including their real names apparently! 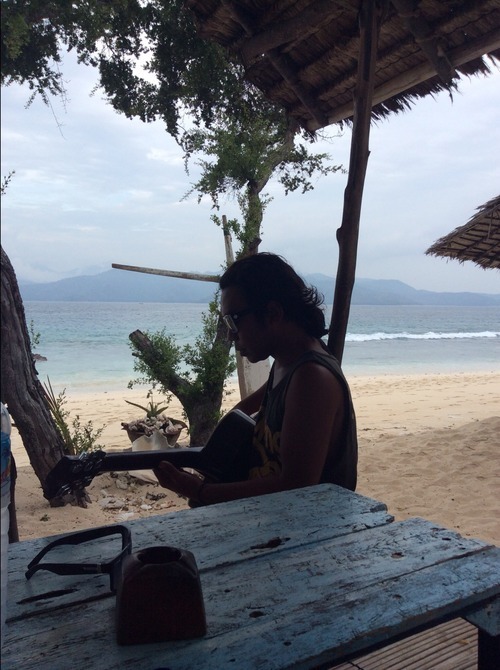 My last week on Gili Meno, I went to the warung one afternoon just to hang out with him. He was strumming on the guitar and out of the blue he turned to me and said, “by the way my real name is Simpre-a-juan.” When he told me this my heart skipped a beat. Barone is not an emotional person and never shows his feelings but that small act of telling me his real name showed that he considered me to be his “kakak” or “sister”. As I was leaving I told him that I would send him a postcard when I returned to the States to which he replied, “not for nothing Amanda but I would hope that you would send more than just a postcard and perhaps some Ruppiah. Haha. Gotta love Barone he keeps it real! The day I have a job and an income again I am sending him some ruppiah and an apron that reads “kiss me I’m the chef”. 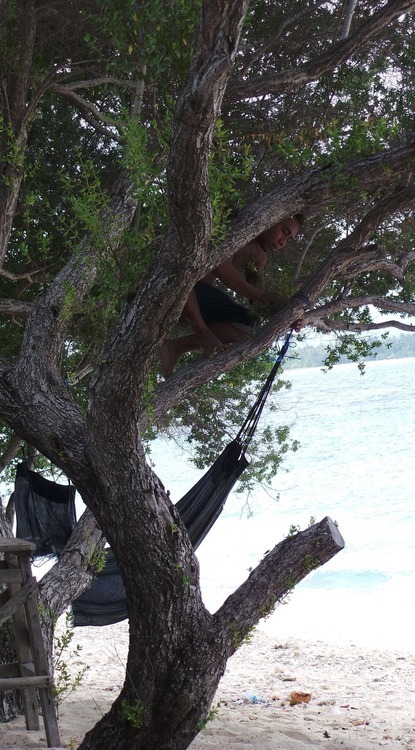 The hammock at Barone’s warung broke one day so I bought him a new one and he was so excited he hopped up in the tree and put it up straight away. 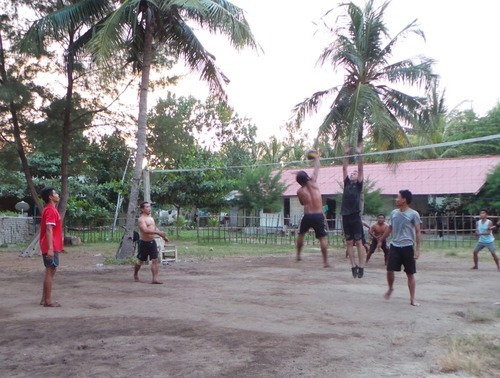 A typical day at the warung! How can you not get a kick out of him; after volleyball one day he wanted to cool off and wanted to smoke a cigarette so he did both at the same time- ha! I”m going to miss him! 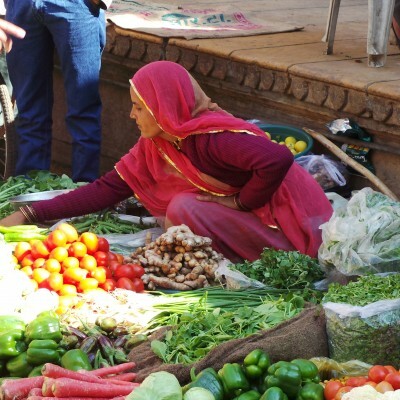 Noorjana was one of the ladies who sold fruit on the beach. 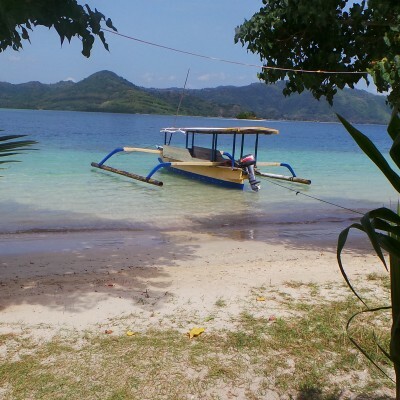 I remember the first time I was on Gili Meno she liked a gold change purse that I had. When I returned the next time I found it and gave it to her. She was so thankful that she invited me to her house for dinner the next day in the village where she lives with her 2 married children with their spouses and multiple grandchildren. After this, she claimed me as her own and no other fruit ladies were allowed to approach me.